The Massive Open Online Course Edfuture 2012 (CFHE 2012, Current/Future State of Higher Education: An Open Online Course) started on October 8 and will be running for six consecutive weeks. Since I am currently working on an article about future trends in educational technology, I was very excited to learn about the course and plan to participate as intensively and regularly as my schedule allows. Unsurprisingly, the last week has been busy at work, and after a brief review of the reading material on Monday, I “skipped class” for the remainder of the weekly MOOC format. Checking back in on Friday only to get ambushed by “505 Unread Discussion Messages” that had secretly been piling up in the course forums, left me disheartened for a second. As usual, it pays to take a deep breath and a closer look at the MOOC’s course activities. In “The Changing Landscape of Higher Education” (2011), the authors David Staley and Dennis Trinkle argue that focusing strictly on technology trends can obscure other environmental factors that are drivers for innovation in higher education. I feel this is an important message for the educational technology community, which often sees change as technology centered. The 2009 UNESCO study, “Trends in Global Higher Education,” gives an excellent overview of large-scale developments that influence higher education across national and regional boundaries. More specifically, the report discusses globalization, “massification,” the increase of student mobility, the growing role of quality assurance and accountability, competing financial models that result from the perception of education as either a public good or a private good, and “the private revolution” – that is, the rise of private, for-profit academic institutions. The course format of CFHE 2012 comprises two 30 minutes video sessions each week, usually with an invited guest speaker. On October 10, Jeff Selingo, editorial director, vice president and regular columnist at The Chronicle of Higher Education, highlighted change drivers in the tertiary sector. On October 12, Professor Siva Vaidhyanathan, Chair of the Department of Media Studies at the University of Virginia, took a critical look at the pedagogical potential of Massive Open Online Courses. Unfortunately my Mac Book, I, and the Go To Webinar service had some communication issues. After registering and being informed that I was successfully logged in to the session, I could neither hear audio nor see any slides other than the title. A review of Vaidhyanathan’s talk can be found in Geoff Cain’s Blog, a recording is not available (yet). 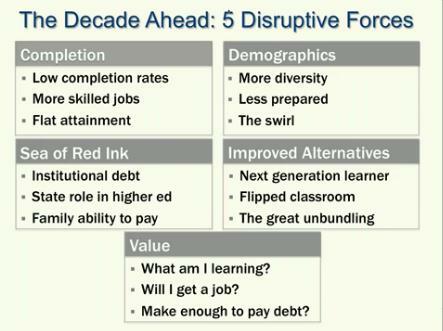 Fig 1: In his talk, “The 5 Disruptive Forces That Will Change Higher Education Forever,” Selingo identified factors likely to impact education over the next decade. After a period of stability and growth from 1999-2009, US higher education institutions now face considerable challenges, Selingo explained. (online recording). Raising debts, massification, poor public image, questionable learning outcomes – there was definitely a sense of “no future for you” in the first week, in particular during Selingo’s talk. However, seeing so many higher education administrators, teachers, program developers, instructional designers and students coming together in the context of CFHE 2012 makes me think that the future of tertiary education surely is not all that bleak. This week’s topic is “Net Pedagogies.” I certainly hope my personal attendance rate will improve, and I look forward to engaging in more in-depth discussions with the other participants. David F. Shaffer and David J. Wright “A New Paradigm for Economic Development: How Higher Education Institutions Are Working to Revitalize Their Regional and State Economies,” SUNY, March 2010. Edgar Morin (tr from French by Nidra Poller), “Seven Complex Lessons in Education for the Future” (UNESCO, 1999).